Eternity Ring DVD is the first one in series on Advanced Jewellery Fabrication. This is to help you to make the most of it. If you do not know what I am talking about, follow this link for more information. I am receiving a lot of emails with various questions about different aspects of the DVD. To address it – here is a write up to navigate around pitfalls of the project. First, lets define “advanced hand fabrication”. When only hand tools and basic techniques are employed, there is always a possibility of something to go wrong and render everything a complete waste of time. It is absolutely unacceptable, from business point of view, to invest a lot of shop time and resources and be at the mercy of a chance. A number of approaches have been developed to manage the risk existing in a project of complexity. The techniques, and/or sequences of techniques, structured to manage such a risk, in conjunction with the goal of obtaining high degree of refinement, are called advanced hand fabrication. It is only the third reason that is discussed here. Errors can be either of technical nature ( technique was applied incorrectly ), or the timeline of a project was sequenced improperly. Some errors are fatal, while others result in degraded appearance. The DVD shows a path leading to successful completion of the project. You are welcome to experiment with different sequences of steps, different stone sizes, and etc… One can learn tremendous amount, simply by doing this project over and over again, trying out different variations. There are two things that can go wrong in Part One. The finger size must be determined accurately. The thing with eternity rings is their size cannot be changed. So from the very beginning it is important to size it correctly. The second is not getting the joint tight enough. The inner ring will be subject to subsequent soldering. If joint is not tight, it will reflow. You should not depends on anti-flux and similar concoctions to prevent joints from reflowing. At best they are only minimally effective. A tight joint is a much better insurance against reflowing. When joint is tight, only a tiny amount of solder enters the joint. The solder actually forms an alloy with joint material, and melting temperature of such an alloy is higher then melting temperature of solder. If joint is somewhat loose, the solder simply fills the space. There is nothing to stop such a joint from reflowing. Here I start on cluster construction by bending strip edge-wise. This is a counter-intuitive, and it has been suggested that piercing required shape from a sheet is easier and faster. My answer is that such a suggestion fails to take into account theoretical required tolerance, and what can be done using hand tools alone. Whether this project “dies” or “lives” depends on how well inner ring fits inside the cluster. Tolerance of 0.1mm, which some say is a norm for goldsmithing, is way too loose, and 0.01mm is more realistic. But how such a small quantity can be controlled using only hand tools and only basic techniques? The trick is in understanding the reason for such close tolerances and using techniques where precision is natural outcome, and not the result of Herculean effort. The reason for 0.01 tolerance is due to the all round parts have some degree of eccentricity (they are not as round as they should be ). This is absolutely unavoidable. In special applications, where perfection is required, special techniques are employed, but jewelry mandrels are not made that way and the ring stretched on a particular mandrel will have mandrel eccentricity by default. By bending strip edge-wise to smaller diameter and stretching it on the mandrel, the same degree of eccentricity is imprinted. So we have two parts with matched eccentricity as a natural outcome of the technique. All we need to do is to pay attention only to dimensional tolerances, which are challenging, but not as draconian as if compensation for eccentricity would be required. If we decided to pierce out the shape, the required tolerance would not be achieved and that would doom soldering step to fail, and thereby the whole project. If you still not convinced, go ahead and try it. Experience is the best teacher. The middle of the road strategy of piercing smaller shape and stretching it, is not much better. I am going to leave it to you to determine the reasoning, as a home work. If you cannot figure it out, let me know and I post an update. Here we solder cluster top and cluster walls. Very critical phase ! Take some time to study the picture of completed ring. Pause your DVD player and study it. Part four has a 10 seconds close up. It was provided on purpose, so take advantage of it. Ask your self, after all the piercing and filling, how much of the original joint remained? Not much at all. If there are any imperfections in soldering, they may be in areas which left, and these areas are all load bearing. Even if such ring survives setting and polishing, which is unlikely; it is going to fall apart while worn. Not a good way to build amenable client relationship. To insure joint soundness all the way through out, a cleanliness is a must. If you noticed, I pre-treat surfaces with flux. The main reason for this is to see how clean the surface is. If flux covers the metal evenly, without any breaks, joint is ready for soldering. Use minimum amount of solder. You can always add more solder, if estimated amount is not enough. The main thing to watch for in part four, is not to destroy what was accomplished in part two. The bottom of scallops are shaped and it must be done so not to enlarge inside diameter. Also diamond seats are prepared. How to properly space them explained on DVD. I did get a lot of questions on drilling. The reason I drill the way it shown, is to prevent over-heating. The drill breaks because it looses ability to conduct away swarf. This happens because drill over-heats and swarf instead of forming a spiral, comes off as flat band. 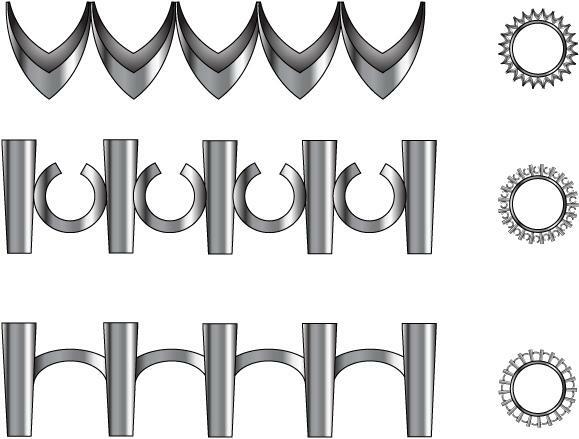 The band cannot travel through flute of the drill and starts folding on itself, eventually jamming the drill causing it to break. Lubrication helps only a little. By drilling as shown, the over-heating is controlled and problem of drill breakage becomes a non-issue. Cluster and inner ring are assembled in part four. A few things on achieving tight fit has been mentioned before, but some questions still remain. As you see on DVD the parts are assembled under pressure. The fit is so tight that fingers are not enough to squeeze them together and few taps with mallet are used. To achieve the fit – measure outside of the inner band. Keep in mind eccentricity. It means that you should take several measurements in different places and average it out. Once you got you dimensions, mark a place on your mandrel, which corresponds to outside dimensions of inner ring. Once again, mandrel must be measured at several points and results should be averaged out. The spiral is stretched to the mark. Watch out for spiral springing back a little. After stretching, put it back on the mandrel and verify that it is still the right size. Adjust as required. Soldering is the main even in part five and it must be done exactly as shown. If you used to solder using soldering pick, it is time for retraining. Remember, one mishandled joint can ruin the whole project. It can be done with soldering pick, or tweezers, but consider the risk. If I misplace a paillon of solder, I simply reposition it. If it is still not good, I can do it for as long as it takes. If solder is introduced with the pick, no corrections are possible and you will have to live with the results. Since so much depends on clean appearance of the joints, I see no reason to jeopardize the project. This is classical risk management. Remember, the goal is not to demonstrate that you can solder standing on your head and holding torch in your teeth. The goal is to bring the project to successful completion. All azure patterns starts with round openings. Many variations are possible, but I limit myself to just these. The upper row shows sequence of cutting azure, when movement of the blade is not obstructed. The situation are encountered in cutting underneath pave plate, which is set independently and soldered in later. The saw blade is inserted in the opening and one corner is shaped. It follows with the second corner, the third, and the fourth. The result is a square. It should be noted that blade is held angled so the other side of the plate remains untouched. Only one insertion of the blade per opening is required. 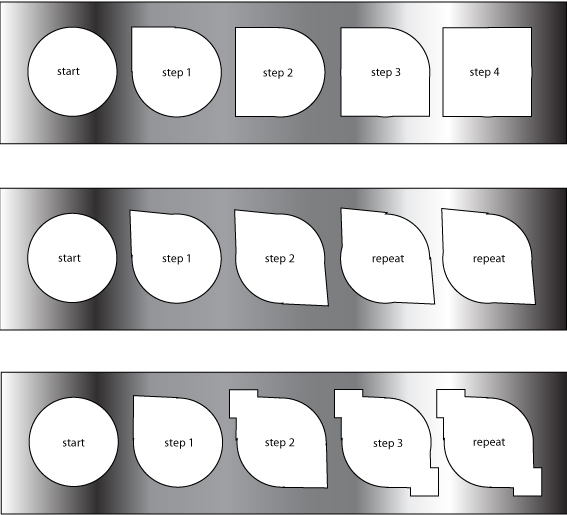 The second row shows sequence of cutting underside of a ring. Here blade is obstructed by the ring itself, so only a side at a time can be addressed. It is possible to cut the same pattern as for pave plate, but it is cumbersome. Better results are obtained with pattern shown in the middle row. Insert the blade from left to right. Shape on corner. Reinsert the blade from right to left and shape the other corner. It forms a pattern reminiscent of a rope. Third row shows variation of the rope. It is almost the same amount of work, but looks more sophisticated. It is obtained by adding 2 extra cuts per corner. The DVD has enough footage to demonstrate actual mechanics of the technique. Azure cutting is the greatest exercise in gaining mastery of jeweler’s saw. This is a good place to mentioned hallmarking. Obviously, in designs like this, traditional hallmarking is not possible. One solution is to leave an area of the underside to be hallmarked. Since punches cannot be used, it has to be engraved. Also, consider leaving hallmarking out. Clients who patronize jewelers specialized in this type of work, are sophisticated enough to understand the predicament. Clients who put metal content above all, are simply looking for investment and not likely to pay extra for craftsmanship anyway. Stone setting phase is relatively simple. In this type of jewellery, a lot of stone setting steps are incorporated in fabrication process. At the point where stone is actually going in, all that needs to be done is to adjust seats and secure the stones. However, on DVD I am doing additional step which requires explanation. You probably heard many times from your instructors to make sure that stones are snapped in. You were told that stones must fit very tightly, but I bet that nobody bothered to explain how it is actually done. If seat is exactly the same size as stone, you would not be able to place the stone in. If seat is larger than a stone, then by definition it is not tight. So we need another method. On DVD I am using 3mm stones. I prepare seats with 3mm bur and that, due to eccentricity explained earlier, would give me seat which is larger than 3mm. You may say “so what”. It is a big deal, even if only few hundredth of a millimeter are involved, because the slightest lateral movement of the stone, makes it a candidate for becoming a stone lost. These imperceptible movements at first, are going to become larger and larger; and that will create excessive wear of prongs from the inside, and one day a client would notice that where it used to be a stone, there would be an ugly hole instead. To prevent it, a two step procedure is used. First a stone is secured for setting, and then it is actually set. For this particular project, a stone is secured for setting by rounding off prong tips. It will only prevent stone from popping, when sideway pressure is applied. The seconds phase is using special pusher, where prongs are driven against stones to lock them in place. That covers it. In conclusion I would like to point out that using techniques demonstrated on DVD and trying out variations with azure patterns, prong patterns, different stone sizes, square stones, combination of square with round, and others – a lot different jewellery can be created. Every variation will present different set of problems, but if you can successfully follow the DVD, you should be able to solve these problems with relative ease.